William Dixon’s tunes re-visited – the problem of key signatures. Modes or tastes and William Dixon again. What’s in a word? The fiddler and his art. How did they do it? George Moss : pibroch notations. George Moss again – and more. In my earlier writings about George Moss I mentioned that when I first met him in 1970 he was no longer playing his bagpipes. However by the end of that decade he was prepared to try blowing them up for me to record a few samples of his style. 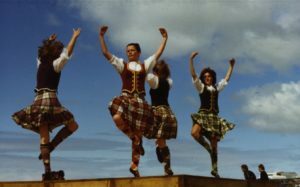 This photo was taken onboard my sailing cruiser Foxglove in 1981. I had anchored a few yards off Kessock in Inverness Firth on my way back from a long summer cruise with my family among the outer Hebrides. 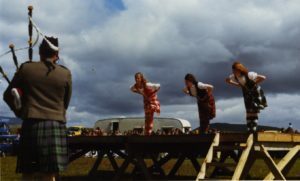 That cruise had given me the opportunity to meet many fine traditional musicians and to witness some of the events at the South Uist Highland Games. George’s cottage was very close to the beach at Kessock and we spent a couple of good evenings with him and his neighbours and my crew Manfred Szell. 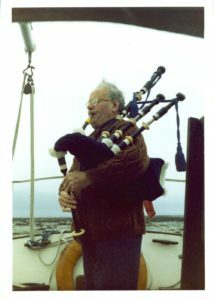 On the morning when we sailed off to continue our return to our home port (Cramond) George came aboard for brief ceilidh and blew up his pipes.